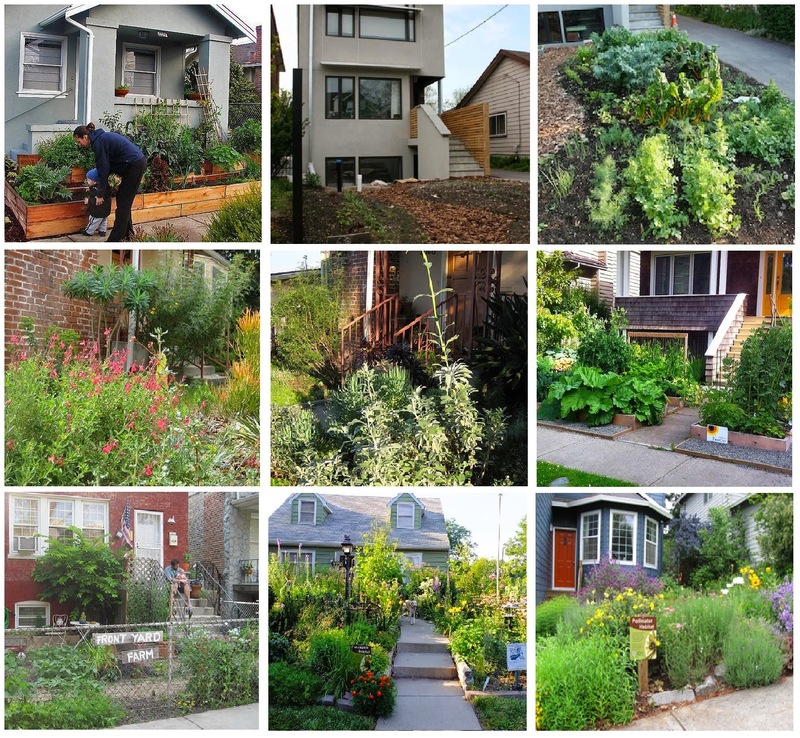 ASLA's video on "Designing Neighbourhoods for People and Wildlife"
The webpage also provides reasons to consider wildlife design and benefits from this type of design for both people and wildlife. It's great to see this association promoting a different approach to landscaping both public and private yards. 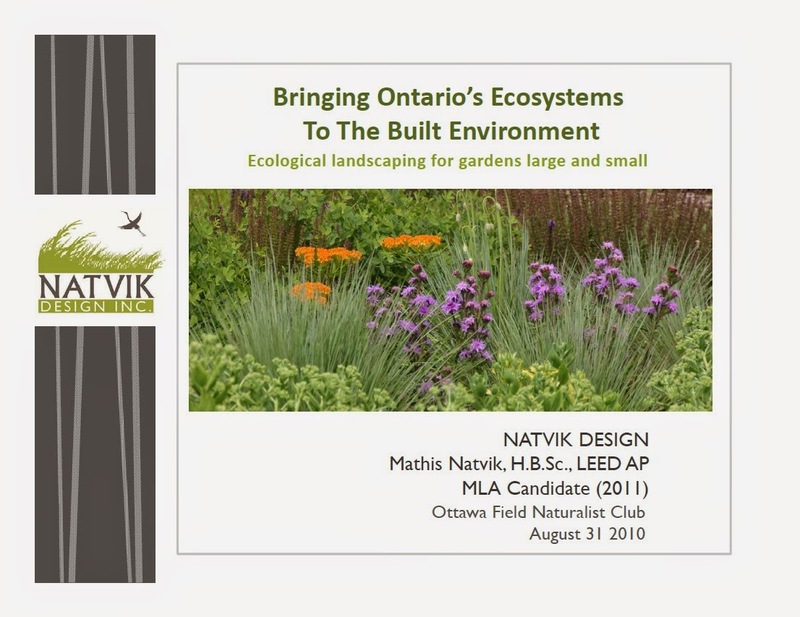 Hopefully more and more graduates of landscape architecture will make Native and Sustainable Landscaping a priority when working with clients! Q. macrocarpa is called the Bur Oak. It is a native oak, an edible species of the landscape of the City of Ottawa. This oak or the white oak, Q. alba, or the northern red oak, Q. rubra, will grow rapidly and form large canopies. These trees require immense amounts of atmospheric carbon dioxide to grow. They are local trees that will reverse climate change, reduce pollution and skin cancers. They have the strength to withstand ice storms and heavy snow. They are also extremely drought resistant. The natural form of honey locust is extremely healthy and hardy in city traffic conditions. It is almost resistant to disease infestations. 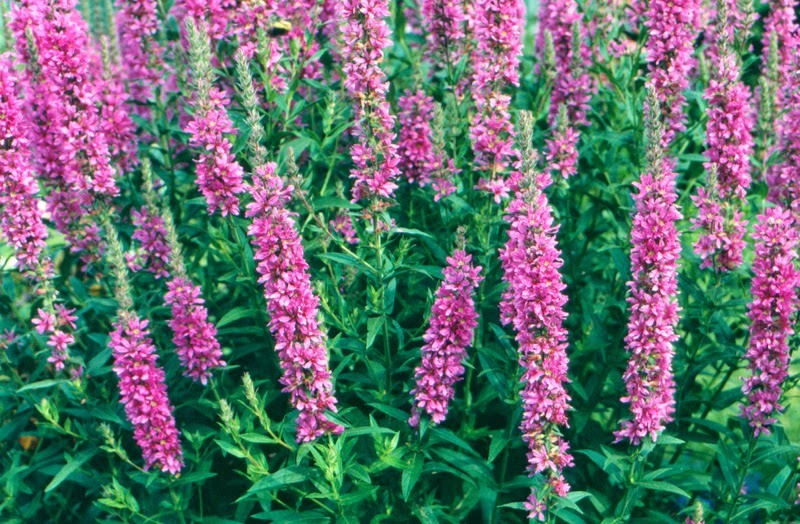 It is drought resistant and it fixes its own nitrogen from the atmospheric nitrogen dioxide and from the soil. The locust will reverse climate change. The canopy of which produces a high filtered light for city gardens. The tree produces edible beans which can be ground as flour and added to other grains to make flour in various proportions. The flowers of the locust feed beneficial insects which in turn act as predators reducing the need for pesticides. The tree is also an 'Escape tree' for birds from city cats and racoons. This local native tree has flowers in June to July which are immensely fragrant. The lactone chemistry in the aerosols that are produced are beneficial to human health. The tree is the greatest feeding tree in the entire world for beneficial insects. Basswood honey is the best on the continent. This tree helps the bird populations to increase and produce more viable eggs in the spring which in turn reduces the need for pesticides. The Basswood leaves in its canopy combs the city air of its particulate pollution which is a leading cause of heart disease in the asthmatic. Ottawa is blessed with native populations of an evergreen tree called the cedar Thuja occidentalis that the local native people called "The Tree of Life". There are golden, tall, weeping and fastigate forms. The trees’ leaves have glands on the tips of the leaves that can be easily seen by the naked eye. These glands in hot humid air release an aerosol medicine into the air that regulates the beating heart and is antiviral. The tree is also drought and fire resistant. It feeds birds and protects them in the winter adding 2 degrees centigrade to their body heat within the shelter of this evergreen. The walnut tree is a medicinal tree. It produces anticancer bio-chemicals both in the mature foliage and in the nuts themselves. Ottawa has a very high cancer rate. This tree would act as a shield for this, most especially for the children of the city who are most vulnerable because of their high metabolic rate when they are in growth spurts to adulthood. Pound for pound, the flesh of the walnut is equal in protein to the best black Angus t-bone steak. The tree is strong and wind resistant. It also has a wide canopy which reduces summer cooling costs. The wood of this tree is one of the most valuable in the world. A well grown Juglans nigra ‘Thomas’ in the city will pay for a grandchild's university education, quite easily. A full canopy of black walnut generates chemical aerosols which will neutralize toxic benzene from the traffic. All of the fir are drought resistant. They will withstand heavy snow loads and ice. The conical form of anatomy of the tree helps them to stand straight, also, in high winds. The branches have a special form of buttresses built into them. These trees guard all the waterways, canals, lakes and river systems helping to purify potable water which is increasingly an issue for cities and urban areas across the world. The chemistry from the needles or leaves produces airborne aerosols that are antiseptic and antibiotic. These trees act as air cleansers and as deodorants on a massive scale. This super clean air is a health benefit to the city of Ottawa and to the surrounding area. There are two trees of choice, the Abies balsamea, known as the balsam fir, balsam, Canada balsam or the eastern fir. This tree is native to the city of Ottawa. The other is the Abies concolor known commonly as the white fir or white balsam. This is a Canadian species, the best cultivar for shape, form and drought resistance is A. c. ‘Candicans’. This tree is also a songbird shelter and escape route for predation. The white spruce is the workhorse of Canada. It has a long and important history on the landscape especially for Ottawa, where it grew on rocky areas overlooking the Ottawa River. It was one of the trees with long tracheids that made pulp which made paper that made money for the lumber barons. Their names can be found inscribed in Rideau Hall, residence of the Governor General. The tree is famous for its pharmaceuticals, one of which reduces blood pressure the other is anti-anginal and helps the heart itself to beat. This is a medicinal tree. It is evergreen and can withstand snow loads and strong winds. The resin of the tree helps all flying beneficial insects especially the honey bee. This tree helps to stop Honey Bee Colony Collapse. The best spruce for Ottawa is the common, native white spruce, Picea glauca. It is known as the skunk spruce. The latter is a common name given when the science of the aerosol medicine was not appreciated by the pioneers, but was used by the aboriginal medicine men for 40,000 years on this continent as a medicine. The catalpa is the most spectacular flowering tree for the city of Ottawa. The bloom clusters are bigger than a man's head. The flowers are white and fluorescent purple. The long beans hang in tassels into the fall and winter. They are the food of the red cardinal birds who love to split open the bean and eat the seeds. This tree is suited to the calcareous soils of the city of Ottawa. The tree can be easily grown, it is disease and drought resistant. The horizontal limbs and main branches in the winter are flexible and will withstand heavy ice and snow. The blooms are like orchids and attract butterflies. The author, Diana Beresford-Kroeger would like to see these trees widely planted in the downtown area as a tourist attraction for a festival of their flowering in June to July. Such a tree allée would also help to maintain clean air as the huge leaf can comb air pollution of 2.5 micron sizes, reducing it for easy breathing. It is a North American tree. Its origins are unknown on this continent. The Hickory trees that were cut down for the building of the city of Ottawa were Carya cordiformis. The tree is also known as the Bitternut Hickory, Bitternut, Swamp Hickory and by the farming community as Pignut. It is not known if other members of this family were present at the time. They may have been present because the aboriginal people often planted nuts. These trees would have been Carya ovata, the Shagbark Hickory, the antifamine trees. The Hickory is unique to the continent, except for China. It grew to enormous proportions here. Fingerprint boles account for circumferences of 18 feet on shallow soils. The Hickory is a feeding tree for birds, man and mammals. It is also a butterfly tree, used in a butterfly’s continental migration. This tree can be planted for a public park or a larger garden. In the last ice storm this Ottawa tree species was badly damaged. It needs to be replaced, also. The Cucumber tree and all the other species of trees that are endangered in Canada could go on a long list. People who are interested in preserving the native heritage and stories of Canada should grow this magnificent Canadian tree. The tree produces a unique cucumber style fruit. From this fruit the frost opens the seed cases and dangles a red seed by a white thread. Birds love these rich seeds. 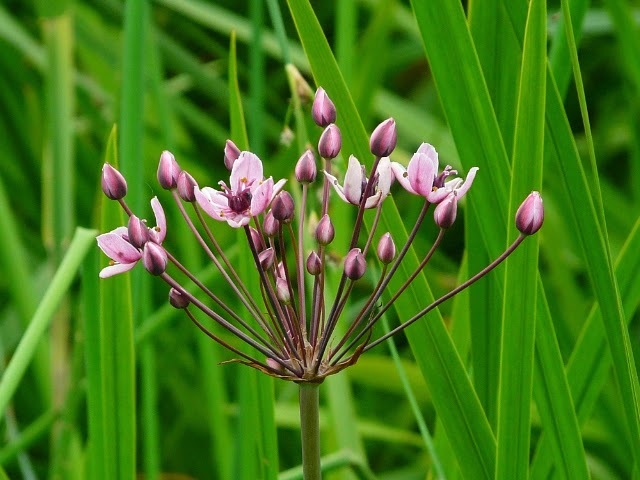 The flower is like a steel grey tulip which is produced at the end of May. From this tree the aboriginal people made anti-malarial medicine. They made dugout canoes for inland travel on their water highways and they carved death masks from its sacred wood. These masks had an important ceremonial function. The cucumber tree is almost extinct. The City could help in a recovery program for its new World Heritage Site of its canal system. Then these trees could be enjoyed by everyone again. They were a waterway tree. Field-grown and container-grown seedlings are available in 1-gallon and larger sizes, grown from wild seed using organic practices. 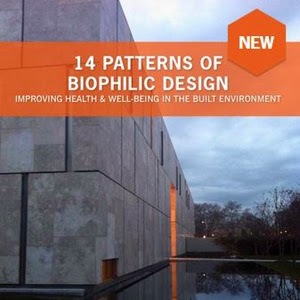 Happy to see architects debating the benefits of biophilic design! 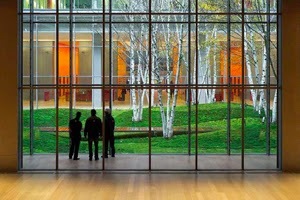 "American sustainability consulting and strategic planning firm Terrapin Bright Green has released a white paper that promises to guide building designers towards more environmentally connected outcomes... 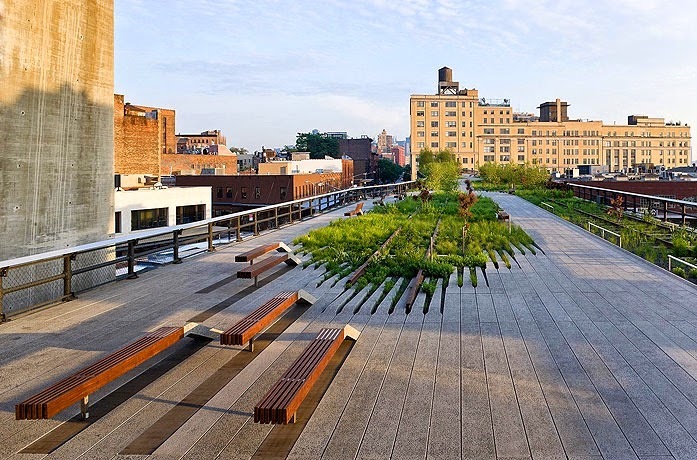 The Terrapin document goes further than just abstract observations however, and offers 14 building design interventions that can be incorporated to facilitate this human connection to nature through built form." Read more here: Architecture Design. How brilliant is this? 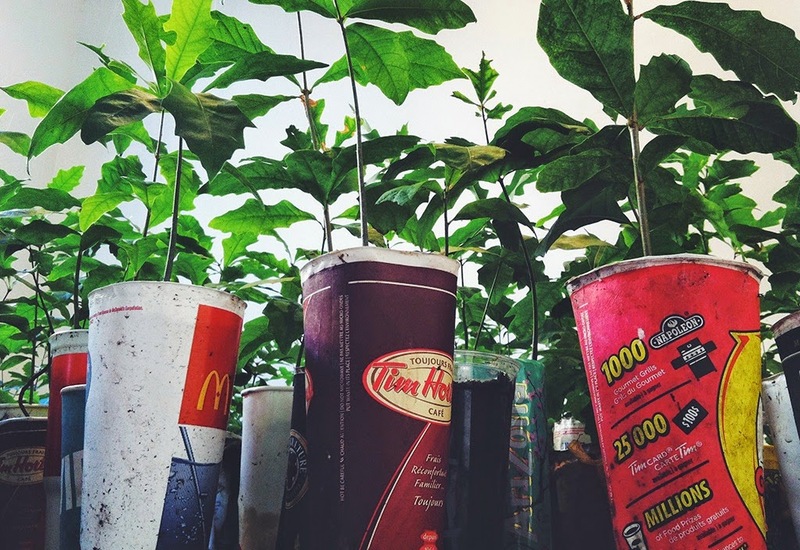 I love the impact this has - seeing trees growing from discarded disposable drinking cups. From Broken City Labs. "Triage: A Propagation Project by Patricia Coates is an ecological intervention and a commitment to acquiring a personal knowledge of the land where she lives... During Triage, a search to acquire a personal knowledge of how the land, trees, soil, and the ecosystem as a whole function has revealed her own complicated relationship, in which good intentions and ‘saving nature’ are questioned." Also from the website: "The seedlings are grown from acorns gathered from Pin and Chinquapin Oaks, two Carolinian species indigenous to Essex County. The ‘pots’ were gleaned from city streets, rural roads, dumpsters and contributed to by family, friends and her own consumption. The trees will be planted on the restoration site and the Essex County landfill: enthalpy and entropy–growth and decay–playing out simultaneously." Ottawa Roger's Cable company (Channel 22) has an interesting show called S.O.S. 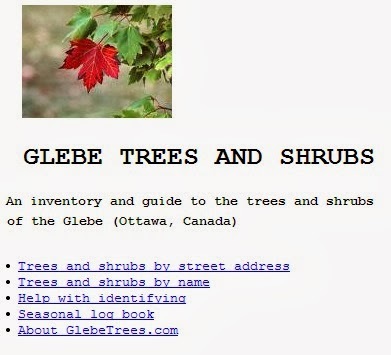 Ottawa Trees that was produced in ??. Currently there are three episodes that talk about different issues regarding our urban canopy. One of Ottawa's greatest assets, the trees that green our neighbourhoods, are under threat from pests, new construction and a harsh urban environment. S.O.S Ottawa Trees takes a closer look at the challenges facing our urban canopy and how you can help keep Ottawa green. In Ottawa, 40 million ash trees are threatened by the Emerald Ash Borer. We take a closer look at this tiny insect and how it's changing the landscape of the National Capital Region. Ottawa is a growing city, but when new homes and buildings go up, often mature trees come down. We look at infill and new construction and how to embrace change while preserving our greenspaces. Planting a tree is easy, right? Get tips from the experts on how to properly plant a tree, and get inspired by our 'Tree Heroes': people who are making sure Ottawa's future is a green one. An East York woman is saving the salamanders of cottage country, rescuing them from local trails and raising them in her backyard. Carolyn Forbes, 28, says she has collected about 350 yellow and blue-spotted salamander egg sacs, each with the possibility of hatching between 20 and 50 babies, from ditches and dips in local roads near her Highlands cottage near Bancroft. 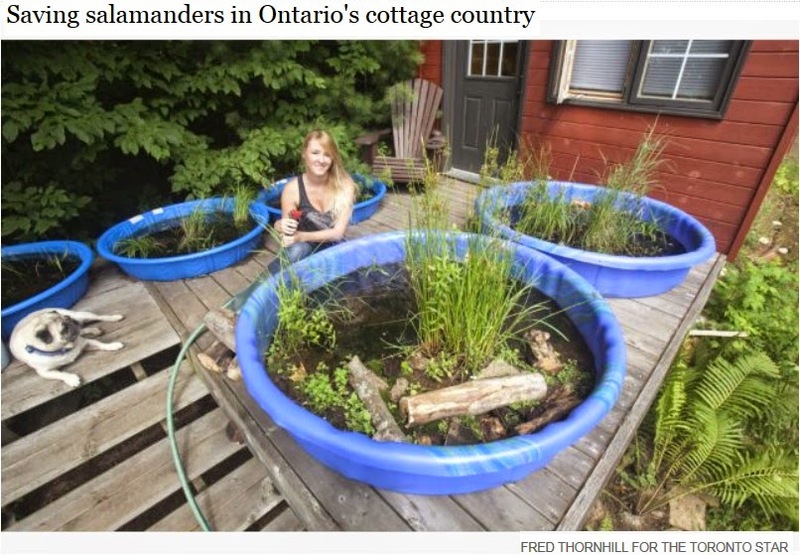 However, Ontario’s Ministry of Natural Resources does not allow amphibians to be taken from or released into the wild. Found this great program to provide opportunities for urbanites to reconnect with nature and destress! 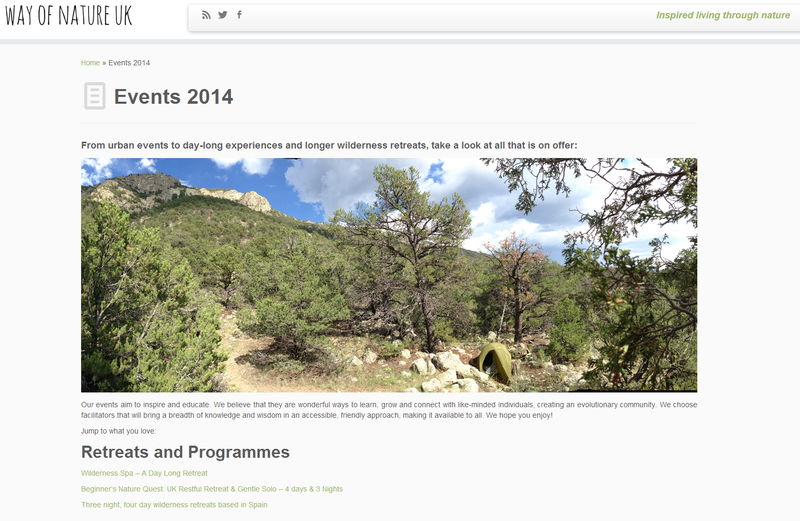 Wilderness Spa is a one day retreat to help you relax and recharge in a wonderful, natural way. Taking place in Epping Forest, a short trip from central London, the day consists of a series of restorative activities helped along by the magic of Nature. The highlight of the day is time alone in nature – a practice of letting nature help you recharge your batteries. Hosted with care, knowledge and fun in equal measures, Wilderness Spa is sure to leave you delighted and inspired. Who’s it for? Wilderness Spa is a great experience for people feeling a need to rest or recharge. With the busyness of everyday life, it’s easy to forget how amazing time outdoors is for us. More so, that we have forgotten the art of relaxation and of being in the moment. This experience is about reminding and practicing how to do all of this." 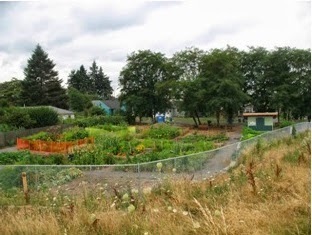 Best land management practices for storm water runoff. The idea is to slow water runoff down - permeable surfaces work better and this can be applied not only to the ground but also roofs (that have impermeable surfaces). Spread it around via rain barrels, french drains and other methods such as vegetated slopes and various gardens. You don't want water to immediately be directed to pipes and culverts off your property. Finally: let it sink! Water can erode if there is not enough greenscaping - bare ground can be an issue just like pavement. Use gravity, include swales and rain gardens and provide some xeriscaping on higher grounds. 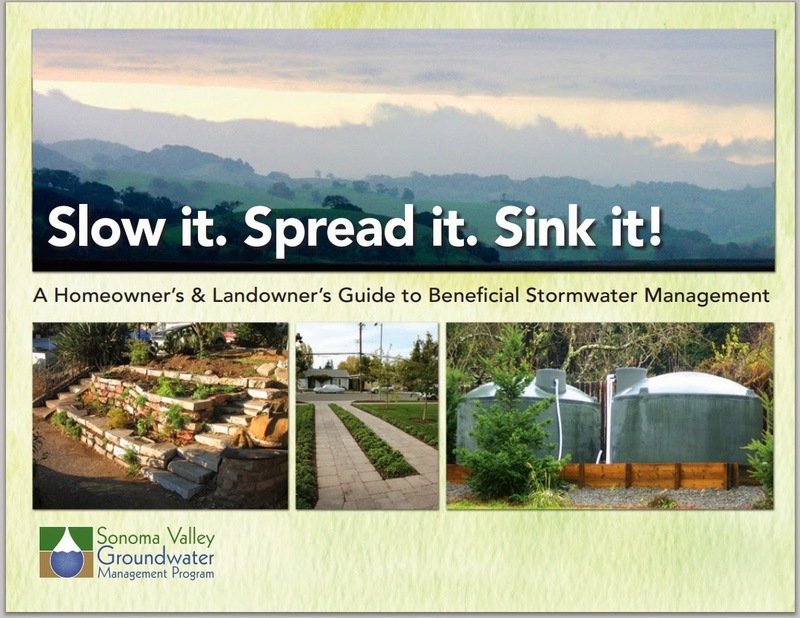 This guide by Sonoma Valley on beneficial stormwater management is very comprehensive and provides lots of tips to homeowners and landowners. Two Depave Projects right here in Ottawa! I first blogged about a Depaving project in California and the organization in Portland in 2012 - finally Ottawa is implementing its own "depave" projects! Lansdowne Park is a large scale project (replacing 11,000 square metres of pavement for grass) where they are "putting the park back into Lansdowne Park". "The new park includes plenty of pathways and seating areas, places for events, a farmer’s market and other vendors, and plans for features like a children’s play area, a water plaza, skateboard park and outdoor rink. Workers have planted over 850 new trees and thousands of shrubs. There’s even an apple orchard in the north-east corner of the park where some trees are already producing fruit. 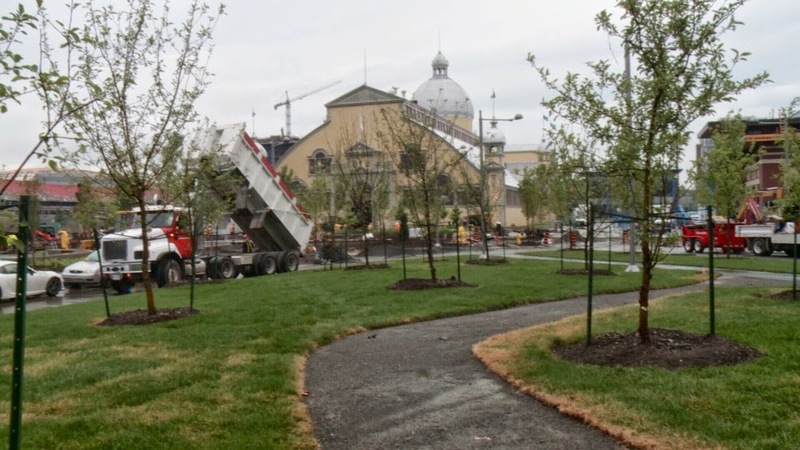 “There’s seven or eight different varieties of apple trees that will be open to the public for picking and there’s a pathway system and a picnic table area in there,” says Doug Clunie of D&G Landscaping – the Ottawa company in charge of building Lansdowne’s urban park. Lansdowne’s urban park is slated to open August 15th." The other Depave project is one by the Depave Paradise organization - working through Ecology Ottawa. 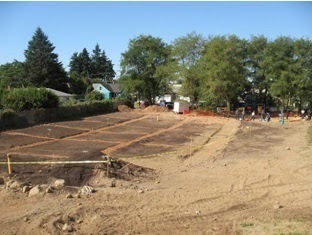 It is being done at Kitchissippi United Church: The Alcove Garden Project (630 Island Park Drive). 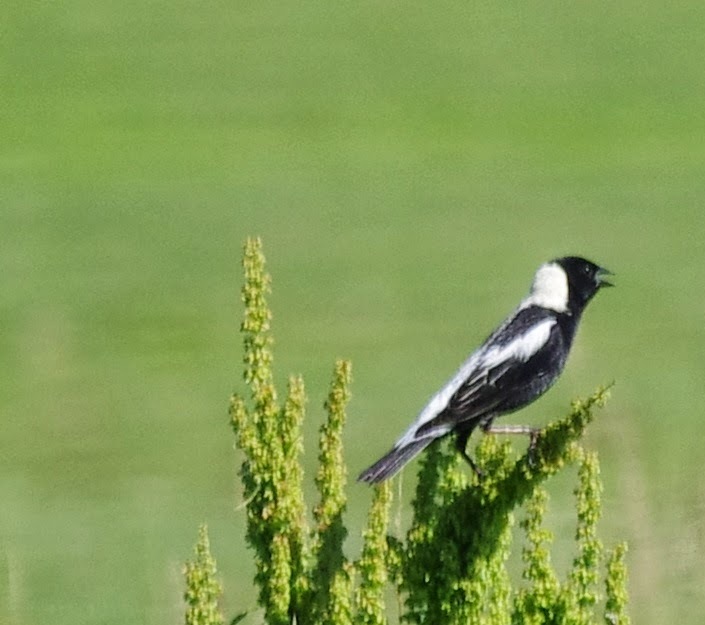 As mentioned in a previous post, I had read about sightings of bobolinks by Dave Collyer from an online post of Manor Park News in 2006 and I was wondering if it was still around. Pretty amazing sighting of this grassland bird in a more urban setting if it is still here! I thought I heard it on Monday in the field between the Rockcliffe Parkway and Sandridge Road (there's a path down the middle of the field for dogwalkers). Using my binoculars I spotted a black bird with unusual markings in the top of a dead tree on the edge of the field close to Sandridge and Placel but it was a faint shadowed view through my binocular lens. I had no camera that day to take a picture and confirm the sighting. I went out with my camera today and couldn't find it in that field. Was wondering if it was in another field close by (or perhaps up at the old Rockcliffe Base?) so I went to the Airport-Marina Road and I ended up finding it in a narrow strip between the Aviation Pathway and the Rockcliffe Airport fence line. The first project is the conversion of the La Rue road median strip from turf to mulch and shrubs. The turf represents a 1950’s-era aesthetic, and requires a high frequency of maintenance (see photo above). The safety of the workers maintaining a turf area in the middle of a busy road is also a concern. 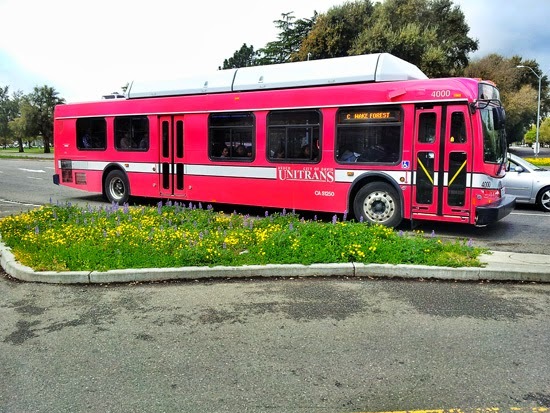 The redesigned median will be designed and built by the Campus Planning and Community Resources team, leveraging the strengths of the Arboretum, Putah Creek Riparian Reserve, Grounds, Agricultural Services, and Landscape Services. The Arboretum will be working with Skip Mezger, Campus Landscape Architect, to design the median using drought-tolerant shrubs and grasses. These plants require lower water use, are more aesthetic than turf, and require less frequency of maintenance. Mulch for the project will be developed by chipping tree branches gathered during routine maintenance on campus, and through removal of eucalyptus trees from along Putah Creek, as part of habitat restoration efforts. Weed abatement at this site began yesterday and will occur again in 3-4 weeks. So now, when you see brown patches here, you’ll know that’s a good thing! The UC Davis Public Garden team is preparing to convert this site! Read about the entire project here. Issues with visibility can be a problem with wildflowers in medians as explained in this post by Dry Stone Garden Blog. "Grasses and Grasscapes: From the Four Corners of the Earth to You, A Talk by Dave Demers"
Dave Demers, a modern day plant hunter and garden designer, delighted his audience with his sumptuous photographs of grasscapes in the wild, and in cutting-edge gardens. 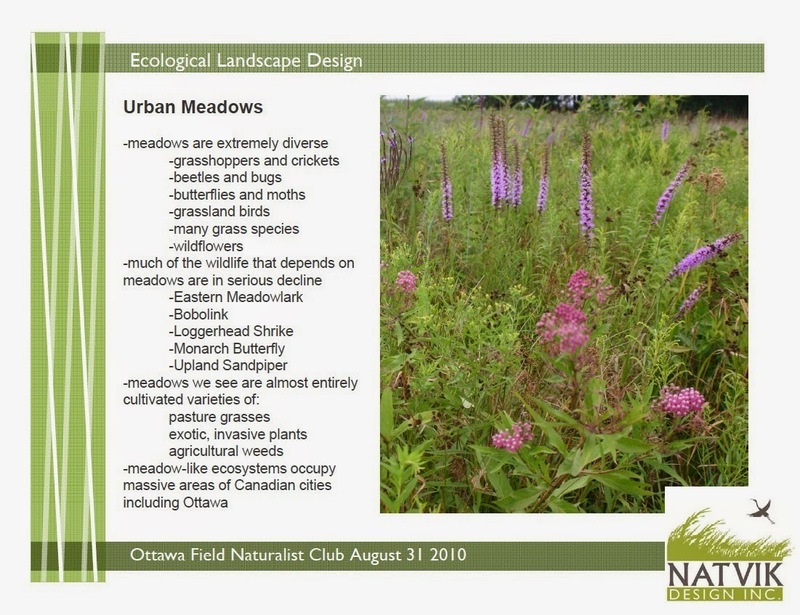 Mr. Demers, who has traveled the world to discover plants in their native habitats, outlined and described the best grass cultivars for our northern landscapes. Dave currently owns Cyan Horticulture, a design-build landscape company in Vancouver. 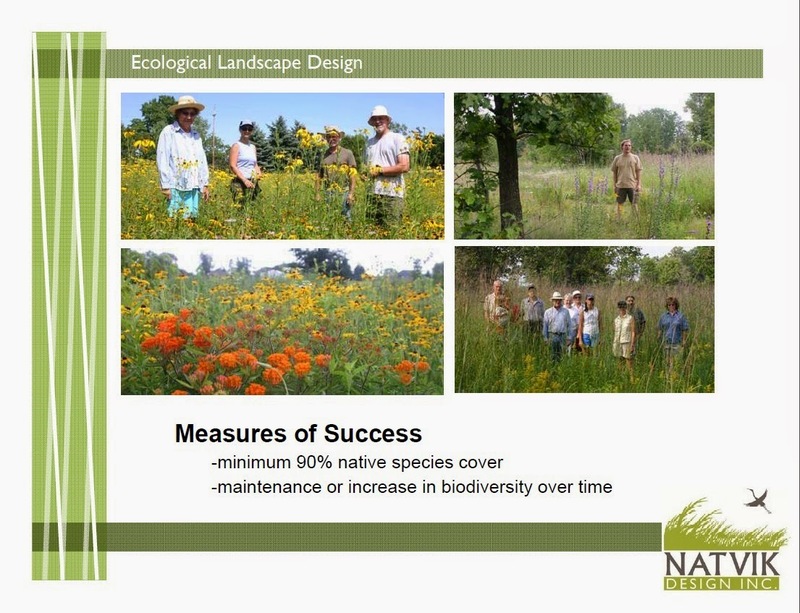 All of this information can be found in their Sustainable Urban Landscape Information Series. "For over twenty years, Cully residents set their sights on the conversion of a 25-acre grassy field in the neighborhood, well-located and large enough for a range of community activities – even if it happened to be the site of a former landfill." Labels: campaign, connection, fauna, flora, landscaping, redevelopment, visit U.S. Recently, my colleagues and I received a grant from the TKF Foundation, a private non-profit that funds publicly accessible urban green space. The project, entitled Landscapes of Resilience: Understanding the Creation and Stewardship of Open Spaces Sacred Places, focuses on acute disasters (such as the Joplin tornado and Hurricane Sandy on the east coast) and compares these disturbances with chronic, longer term economic disruption in our communities. We are studying when, where, how and why residents use greening activities as a mechanism for resilience and restoration. 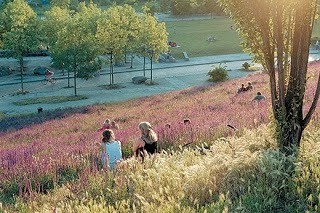 You can learn more about this project here: http://civicecology.org/tkf.php for more details. One of my first research projects with the U.S. Forest Service resulted in a multi-year study to understand the meaning of community-based memorials and acts of environmental stewardship after the attacks of September 11, 2001. The Living Memorials Project http://www.livingmemorialsproject.net/ documented and investigated over 700 memorials nationwide, made them accessible in an on-line national registry, and findings were synthesized in articles, presentations and multi-media exhibits. Our research examines the emergence of September 11 memorials as part of a social-ecological process of resilience and the ways in which ordinary space becomes sacred. Our partnership with artists and designers enabled us to produce an exhibit, Land-Markings: 12 Journeys through 9/11 Living Memorials at the National Park Service’s Federal Hall National Memorial on Wall Street. We were honored to receive the 2007 EDRA/Places Award for Living Memorials National Research: 9-11 and the Public Landscape. 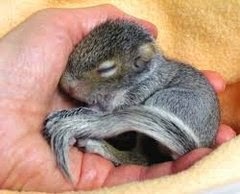 Measures were in place to mitigate the effects of tree cutting on birds and animals in the area, Wilkinson said. Cutting can only be conducted until April 15, the councillor said, to avoid the nesting season of birds in the area. If tree cutting didn't happen before the deadline for bird nesting season, there would be no way for the school to be built in time for kids to attend in September of 2015, Wilkinson said. That tree-cutting deadline is needed to comply with the federal Migratory Birds Convention Act, Snedden wrote. In addition, KNL was asked to follow the tree-removal protocol followed by the city's forestry department. That procedure involves tree inspectors searching for evidence of animal use or habitat, which is shared with tree-cutting crews, who do a second inspection of flagged trees to see if animals are present. If there is an animal in the tree, the tree is not disturbed and the crew returns to remove it once the animal has moved on. Nesting boxes were placed around the area to lure animals such as squirrels out from trees. 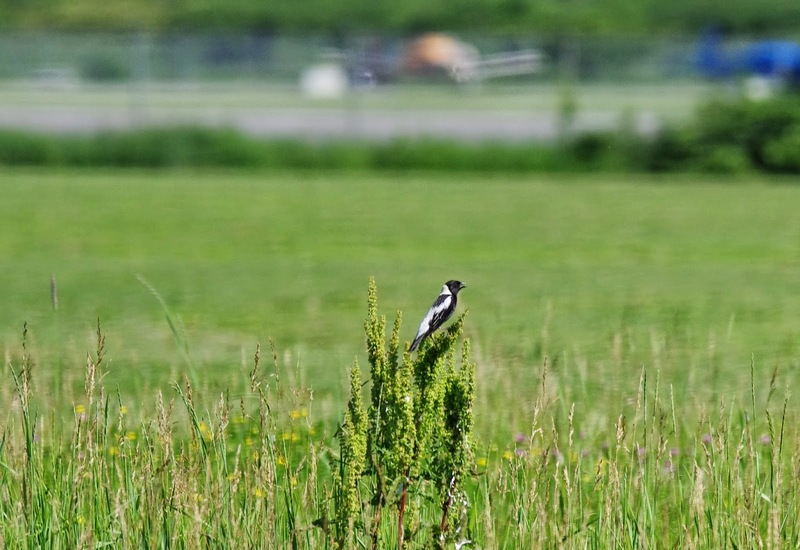 A similar policy is being considered for the wildlife construction policy the city committed to drafting as part of an update to its wildlife management strategy last year. City staff conducted surveys to identify areas where trees and wildlife habitats were to be retained, Snedden said. They also monitored cutting to ensure the removals complied with the urban tree conservation bylaw. Snedden said Blanding's turtles are still hibernating at this time of year based on population monitoring data. Wilkinson said KNL Developments has a certificate from the province allowing it to go ahead with work because the area isn't part of the main habitat of the protected Blanding's turtles. If turtles are found, they must be protected and removed from the area, Wilkinson said. In an effort to transform Gravel Garden into something a bit more visually and ecologically pleasing, Green Access staff teamed up with Ecoman to take on a mini naturalization project that included edibles, native plants, and even some medicinal species! Over the summer, purple flowering raspberry (Rubus odoratus) thrived and red currant bushes bore a tasty first harvest. 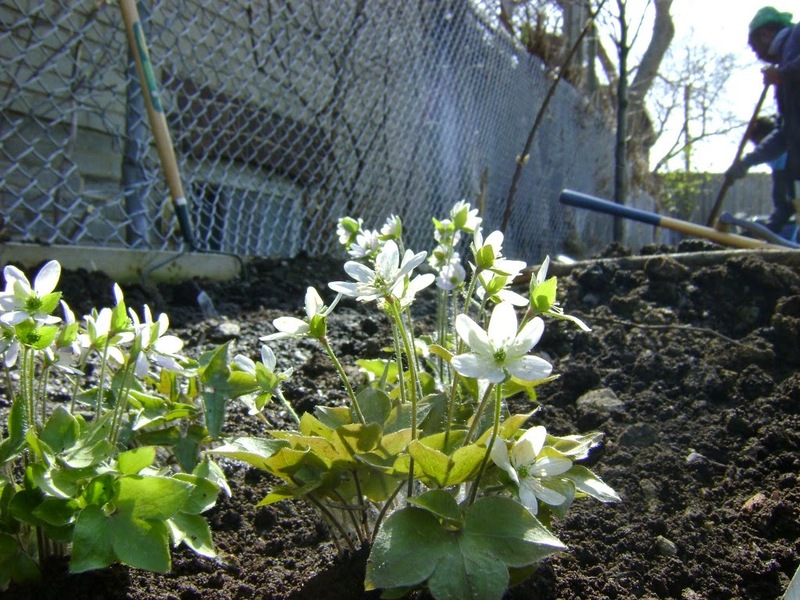 Solomon’s Seal, Hepatica and Comfrey started to get established in the shady areas. We experimented with growing hardy Kiwi (Actinidia kolomitka) and a specially bred variety of honeysuckle with edible berries (Lonicera caerulea). Bugbane (Cimicifuga) and Virginia Mountain Mint (Pycnanthemum virginianum) were also nice additions. Two small transplanted honey locust trees (Gleditsia triocanthos) and one lilac suffered a bit in the hot and dry parts of summer but they ultimately became well-established. Finally, later in the season a couple of America Elder (Sambucus nigra) trees were added. Love that they rescued some trees from a Canada Blooms installation (saving costs!) for the Gravel Garden. And do hope that they post some after shots - would be great to see what it looks like now. Thanks Ecoman (Jonas Spring) for sharing the info! 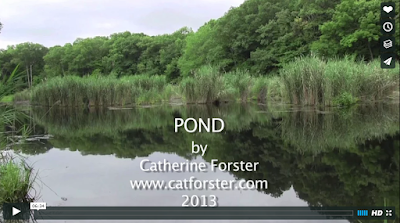 POND from catherine forster on Vimeo. Here's an urban sidewalk design that increase(s) the street trees and the amount of soil they receive using "Silva Cells". "The soil within the Silva Cells is lightly compacted, meaning that it retains pockets of air and water that are essential to healthy root growth and has adequate amounts of room for roots to spread. The new street design also included wider sidewalks, granite instead of concrete pathway paving, and seasonal flower beds. Slot drains capture rainwater that falls on the sidewalk and directs it in to small catch basins that remote floatables and large debris. The water then enters a perforated pipe that extends throughout the Silva Cell system, irrigating the soil volume underneath the sidewalks." 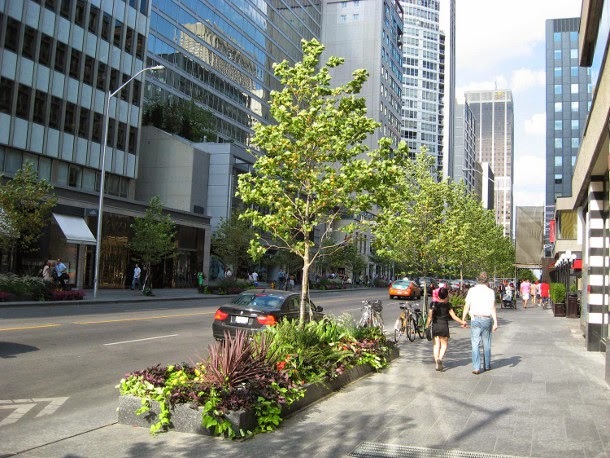 Would it also be possible to plant more native trees as per Diana Beresford-Kroeger as street trees? "On a cool and foggy morning, after a night of rain, the birds are staying put and feeding. 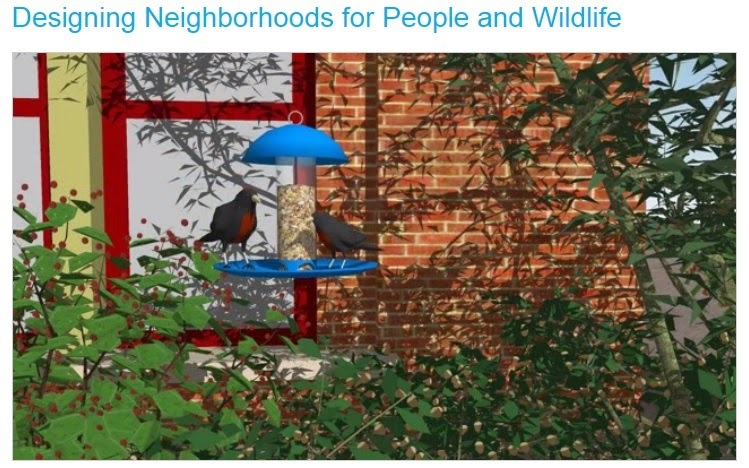 It makes for fine listening, not only to the avian newcomers but also to the familiar urban birds — cardinals, chickadees, red-winged blackbirds, goldfinches and house finches." • Coneflowers: Nine native coneflower species grow from across the eastern and central Lower 48 to the Rocky Mountain states. The plants produce large flowers with sturdy orange-bronze “cones” at the center. During the cold months, goldfinches perch on or just below the blackened winter cones to pluck out the seeds. • Sennas: In many areas of the country, two native species—American senna and Maryland senna—bear a profusion of flowers in mid- to late-summer, followed by long, drooping seedpods. They provide shelter as well as chocolate-colored seeds that offer nutritious winter meals for songbirds and wild turkeys and other game birds. 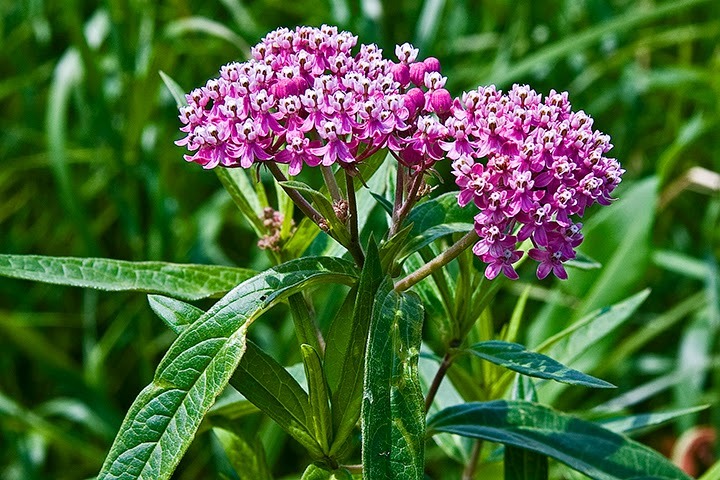 When in flower, sennas are magnets for certain native bees and butterflies. They also serve as host plants for cloudless sulfur butterfly caterpillars. • Other good winter seed sources: Depending on where you live, these may include asters, black-eyed Susans and late-blooming native sunflowers. 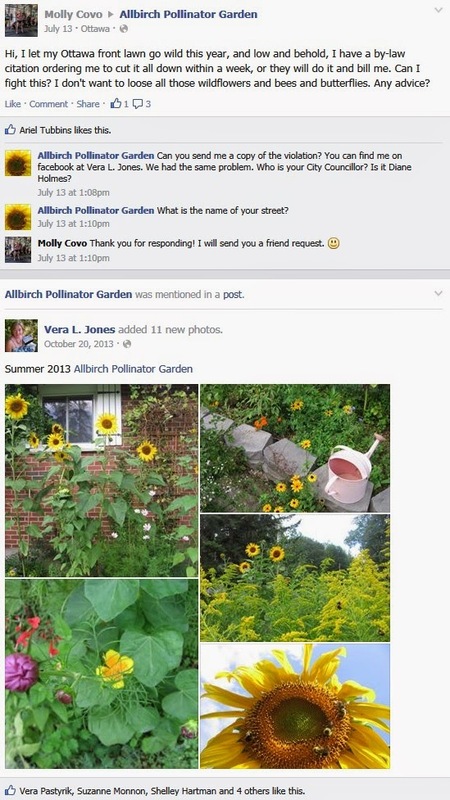 Unless you have room in your garden for them to spread, avoid sunflower species that increase rapidly by rhizomes or that are prolific self-sowers. start planning your backyard for spring! "Birds like moderately untidy gardens with tangly corners, secure sites for well-hidden nests. Cedars and other conifers provide hiding places and shelter. Many species of dogwood have berries for fruit-eating birds like robins and waxwings. Honeysuckle fruits early in the summer and many species of crab-apple trees hold their apples throughout the winter. 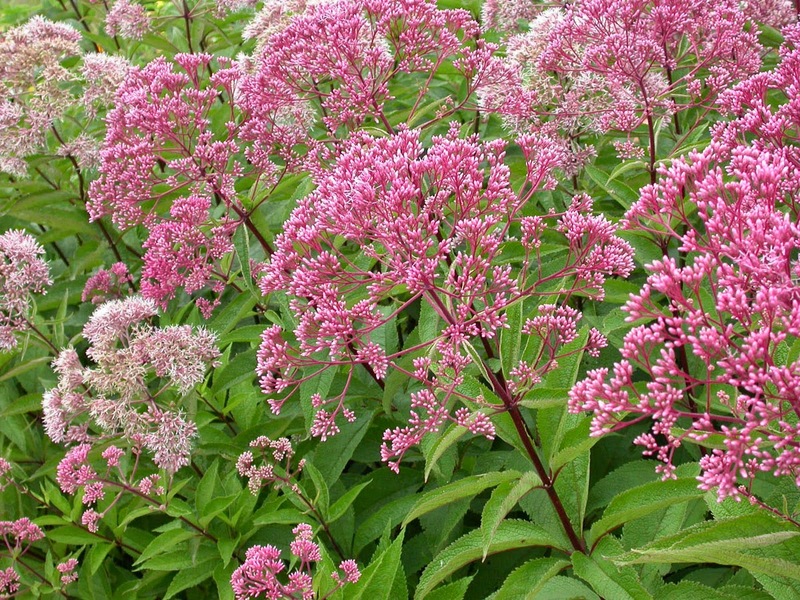 It will soon be time to select perennial flowering plants, berry-bearing shrubs and annual flowers attractive to hummingbirds and butterflies. Red flowers, like monarda (bee balm), phlox, fuchsia and heuchera (coral bells), are perennials beloved by hummingbirds. Annuals like salvia, petunias, geraniums and other colourful flowers will attract both hummingbirds and hummingbird hawk moths. Water, a necessity for all living creatures, should be provided. If you have room, a pond is ideal. Smaller lots can have a bird bath or even large clay saucers. Ponds can be a haven for frogs and dragonflies that are disappearing at an alarming rate due to the pollution of natural water areas. If you stock your pond with fish, you may even attract a great blue heron, or a kingfisher! 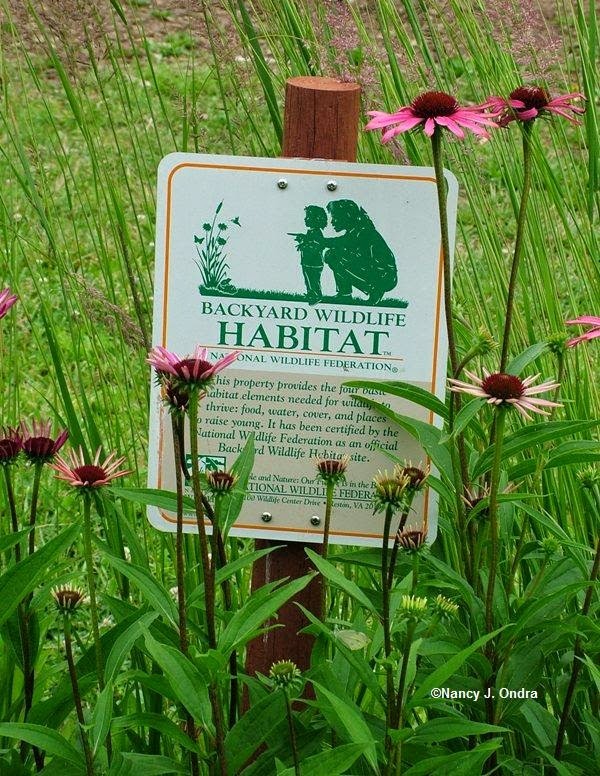 Bird houses for cavity nesting birds and a bird feeder complete a wildlife friendly, chemical-free habitat." Also keep in mind that there may be bee-killing pesticides on those annuals you buy!